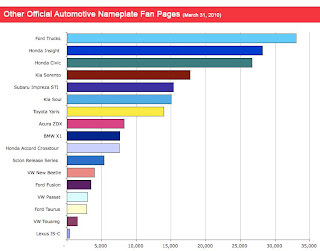 If you are a regular reader of this blog you probably know I have been doing a monthly report on Automotive Facebook Fans that covers how the automotive industry is performing in fan counts and how brands manage to develop their fan base, usually through ad buys or Facebook applications. What I have also been doing this whole time is tracking how some vehicles are performing in the Facebook community. What I’ve noticed is there are a few strategies companies have implemented to interest their customers or aspirational fans. Campaign Driven: Most of the official vehicle fan pages were started at the time a marketing campaign was launched. This was true for the Ford Fusion and the Honda CrossTour. Every Vehicle Gets a Fan Page: Acura and Volkswagen both apply this approach that no matter how few people want to socially identify themselves as a fan of Routan or ZDX, the brand has decided to invest time to curate a fan page for every product in its portfolio. Product Segments: Ford Trucks is one example of this where fan pages are not divided into F-150, F-250, Ranger or other truck products; instead, fans of a Ford Truck can become fans of the entire truck product line. 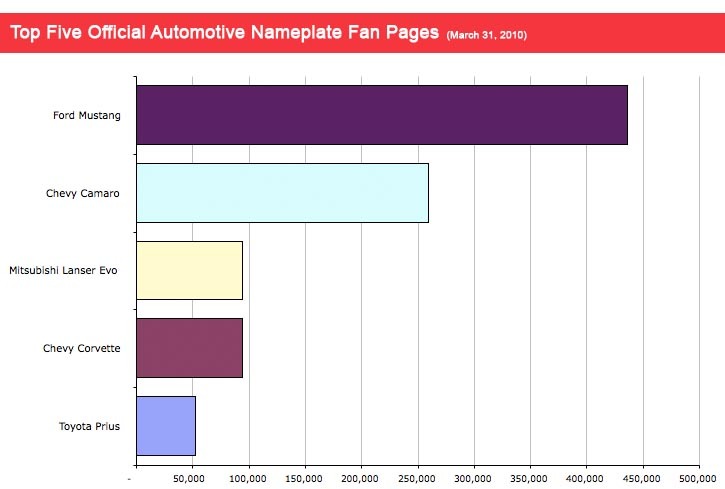 Similar to what we see with brand Facebook pages, vehicle pages also get big spikes in fans from “Become a Fan” marketing campaigns on the site. 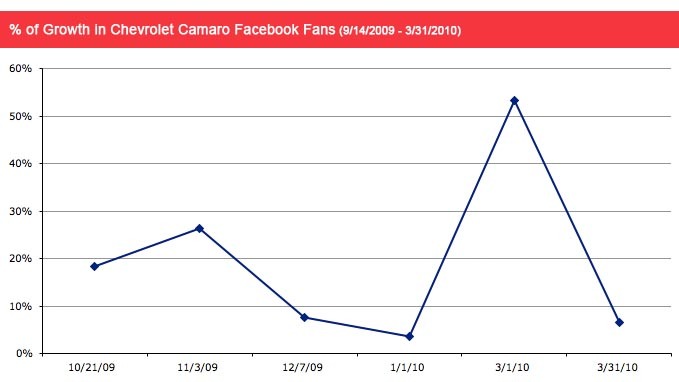 For example, we see a huge lift of Chevy Camaro fans between Jan 1 to March 1, 2010 when the Camaro team was running ad units to increase its fan base. An interesting example of fan growth explosion came when the Honda CrossTour was launched and the vehicle’s wall was attacked by Honda fans who were not happy with the CrossTour design and some nastiness ensued. 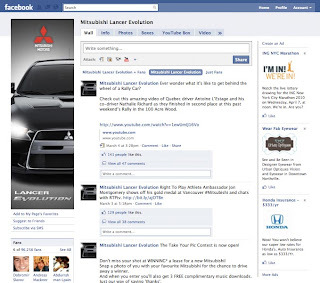 This, plus a “Become a Fan” marketing buy from Honda to promote the CrossTour, led to a 6,000 plus fan page growth in back in August/September 2009. What’s most difficult for vehicle pages is the ability to continue growing fans after a marketing campaign. Sure a vehicle fan page won’t see double or triple growth percentages without some marketing, but even maintaining the typical 3-6% organic growth rate we see on Brand Fan pages is difficult for vehicle pages, unless the car is a sports car. Why is this so? My theory is that people fan the brand more than a car. Take for instance the Lexus IS-C. When it was launched the fans grew to 300+ through some advertising buys, but in the past six months they’ve only added 11 fans (349 in 9/14/2009 to 360 3/31/2010.) Yet Lexus has added 22,000 fans in that same time frame without any ad buys within Facebook; though, Lexus does promote it’s Facebook fan page in email communications. In summary, if your brand is more defined by only a few key vehicles where people have a lot of passion for a particular product then vehicle fan pages make a lot of sense; however, if your brand is more defined by the brand image (e.g. Lexus) then creating vehicle product pages for every car probably isn’t worth the effort and added community management complexity. We've used www.socialkik.com to buy a few thousands of fans for multiple facebook pages and they always over delivered on the number of fans that we purchased by up to 30% of extra fans. After the Socialkik campaigns were over, newer visitors to our Facebook page are more willing to become a fan than before, because they see that it's being liked by over 10,000 of other fans. Interesting that none of Nissan's vehicle pages were included though out-perform many of those you single out here. I'd "like" them over most of these pages any day. Nice article. Well written and very informative.